The Brazilian chemical industry ranks among the top 10 in the world. It exports to China, USA, Argentina, Netherlands, Chile, Germany, Spain, Mexico, Japan, India and other regions around the globe every year. The chemical products exported by Brazil in 2018 amounted to USD FOB 14,228,679,354.00, covering inorganic chemicals, plastics and articles thereof, organic chemicals, pharmaceutical products, essential oils and resinoids, tanning and dyeing extracts, photo products and other chemical products, including PVC. According to the data published by Ministry of Economy of Brazil, PVC export accounted for 0.03% of total exports in 2018, ranking 216th of PPE exports in 2018, and represented 0.07% of exports of Manufactured Products in 2018, ranking 152th in Exports of Manufactured Products in 2018. Polyvinyl chloride, abbreviated as PVC, is the world's third most-widely-produced synthetic plastic polymer, after polyethylene and polypropylene. About 40 million tons are produced and consumed every year. According to Ministry of Economy of Brazil, Brazil exported a total of 65,779.60 tons of PVC in 2018, down by 52.1% year-on-year compared to 2017, with the export value amounting to USD 61.12 million, seeing a 49.2% YoY decrease. 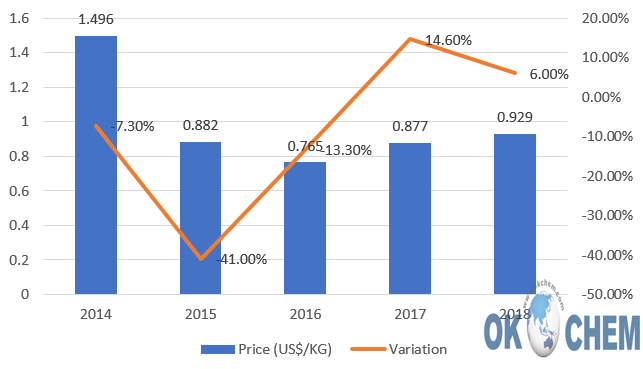 The average export price is USD 0.929 FOB / Kg, up by 5.9% compared with 2017. * Variations in relation to the previous year. 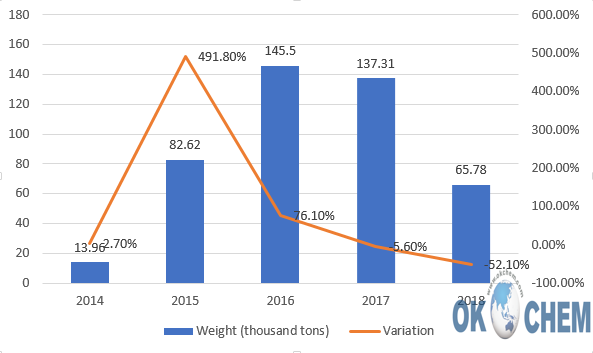 It can be seen that PVC export showed an increasing path from 2014 to 2017, and hit the peak record in 2016 with the export weight of 145,500 tons. However, it saw a sharp drop to 65,780 in 2018. 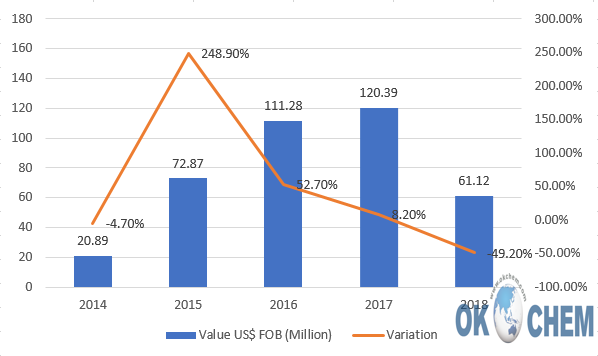 The export value of PVC in this period showed a similar path, which saw an upward trend from 2014 to 2017 with the peak at 120.39 million USD in 2017. The average PVC export price showed a downward trend, despite of a slight rebound in 2017 and 2018. Especially in 2015, PVC export price dropped sharply from USD 1.496 per kg in 2014 to USD 0.882 per kg, falling by 41% year on year. In 2018, the top five export destinations of PVC in Brazil are India, Argentina, Bolivia, Paraguay and Morocco in proper sequence. 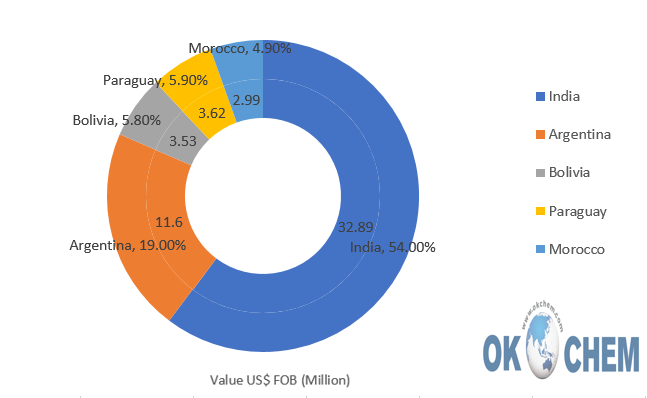 Brazil has exported about USD 32.89 million of PVC to India, accounting for 54% of total export, followed closely by Argentina, accounting for 19%. As a professional chemical B2B platform, OKCHEM is always dedicated to providing best solutions to both the chemical buyers and sellers, with the objective of helping them grow business and go farther. For chemical buyers, we provide a wide range of quality-guaranteed products from the strictly selected manufacturers around the globe; for chemical suppliers, we provide a potential platform to reach a ton of buyers overseas and increase the sales.